The Range Rover Evoque 2019 evolves to become a mini Velar microhybrid – What It Is? It is not a restyling, but the second generation of the Range Rover Evoque , whose first deliveries in the European market will be made in early 2019. The aesthetic evolution will be seen by many as subtle and predictable, we are facing a mini Range Rover Velar . However, the really important changes that the new model has experienced are those that are not seen, starting with a platform planned for the electrification of the model . The Range Rover is Land Rover’s most successful model of recent years. From 2001, Land Rover sold more than 775,000 units in the world. It has been a model of conquest (it attracted the brand motorists for whom this model was its first Land Rover) and the instigator of the growth of the brand. With such an important model it is logical that the brand has chosen not to break the established codes when designing the new generation. The design team, led by Gerry McGovern, has been prudent in designing the new generation of the Evoque. To the point that seeing the new model gives the feeling of being in front of a restyling. The side view is very similar to the outgoing model, so much so that one could think that it is the same car if it were not for the smooth doors with the handles embedded in the door to the Range Rover Velar. Precisely, the Range Rover Velar has been the source of inspiration for the designers for the front and rear of the car. Fine headlights and small calandra flanked by two vertical air intakes, in front, and rear pilots integrated in a black strip that waist all the rear: the new Evoque inevitably evokes the Velar. The dimensions have not evolved too much. The new Evoque measures 4.37 meters in length (the same length as the outgoing model and 15 cm less than an Audi Q3 ), but has a wheelbase 20 mm larger (we go from 2,660 mm to 2,680 mm). According to the brand has allowed improvements in terms of habitability and ensures that space has been increased in the rear seats. It was one of the weak points of the old Evoque. Similarly, its trunk has grown slightly with a volume that goes from 575 liters in the current generation to 591 liters in the new model. Interestingly, once the backs of the rear seats folded down, the maximum volume goes from 1,445 liters in the outgoing Evoque to 1,383 liters for the new model. On board, the changes are more evident than outside. The overall design, including that of the dashboard, is that of the first generation Evoque – and of almost any current Land Rover -, however, the differences with the outgoing model are obvious: there are practically no buttons . The new Evoque has a digital instrument panel, a central infotainment screen that tilts forward to improve visibility when we drive and a digital center console with just three buttons. It is a system inherited from Velar. It is an undoubtedly technological and current proposal, because the navigator and the infotainment system in general are updatable via wi-fi , while the driver will have available a series of apps to connect with his car. You can control the level of fuel via your smartphone, start the heating or air conditioning and even close and open the car remotely. 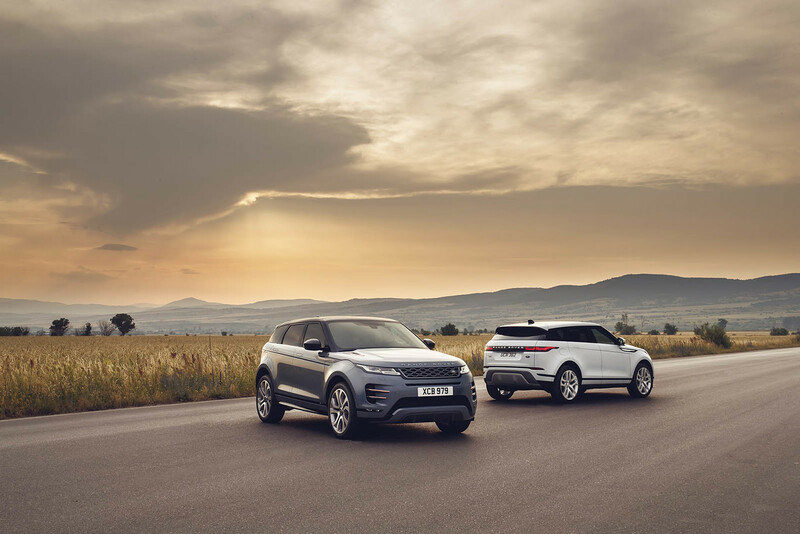 That is to say, the Evoque is updated in terms of connectivity and offers the same possibilities as other brands in that sense. On the other hand, it will be compatible with Apple CarPlay and will have Wi-Fi connection points via 4G for passengers. Another technological aspect is the “Smart Settings” that, according to the brand, learns the preferences of the driver (driving mode, ambient temperature, seat position, music) and prepares the interior according to those preferences. Finally, Land Rover has replaced the mirror of the central mirror with a high definition screen. Laudable effort, but the real revolution would have been to do without the exterior mirrors and opt for virtual mirrors, to the Lexus ES . The new Range Rover Evoque not only inherits the design and digital systems onboard the Range Rover Velar, it also inherits its rear suspension “Integral Link”, which separates the lateral oscillations from the longitudinal ones to improve the dynamic behavior on the road. It is also a more compact design that has allowed to increase the capacity of the trunk. The majority of Evoque will have adaptive dampers in continuous. The new “Premium Transverse Architecture” platform of the Evoque 2019 is, according to Land Rover, 13% more rigid than the previous model and would also better filter the noise and vibrations that reach the passenger compartment. This platform authorizes the electrification of the Evoque with hybrid plug-in versions. The range of the new Evoque, which loses the bodies of three doors and convertibles, will be composed of three gasoline engines and three diesel , with the plug-in hybrid variant planned for the end of 2019. In gasoline will be the supercharged 2.0-liter of the Ingenum family in charge to move the new Evoque. It will offer three power levels: 200 HP, 250 HP and 300 HP. The three engines are of the mild hybrid type with a 48 volt network , while the transmissions will be front-wheel drive or integral traction with manual changes of 6 relations or automatic of 8 relations (ZF change). The brand has not yet revealed the details of the range. In diesel there will also be three engines, the 4-cylinder 2.0-liter 150 HP and front-wheel drive model access to the range. It will also be the only engine of the new Evoque range in not having a light hybridization of 48 v. The two other variants of the same 2.0-liter will be the 180 hp and 240 hp. As for the plug-in hybrid version PHEV will equip a 3-cylinder turbo petrol of 1.5 liters and 200 hp that will be associated with an electric motor of 109 hp and will have a lithium-ion battery of 11.3 kWh capacity. Land Rover has not revealed the autonomy in electric mode. The new Range Rover Evoque is aimed at the premium market, but like its big brothers and the Range Rover itself, the brand has not neglected its off-road capabilities. Thus, it has the new generation Terrain Response 2 off-road management system. The system is fully automatic, just select the type of terrain on which we move and the system manages the traction (transmission, ESP, ABS), the differential locks and the hardness of the dampers. The capacity of the Evoque for wading is now 600 mm compared to the 500 mm of the previous Evoque, the brand assures. But if there is a proof of the importance given to the off-road aspect of the Evoque, that is the transparent virtual bonnet . Named Clear Sight Ground View is a technology that thanks to a series of cameras projects an image of high definition in the central screen that makes the hood (and the motor) invisible. Now we will not need a scout to know what we have on the other side of the ridge or to know where exactly we put the front wheels.